The ADP-2429 is a line of 2.92 mm (compatible with K or SMA) to 2.4 mm (compatible with V) connectors. 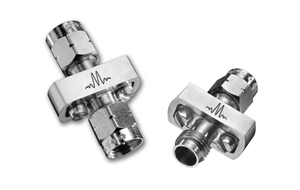 Marki coaxial microwave and RF adapters offer low insertion loss, high return loss (low VSWR), and mechanical ruggedness. Their unique easy-grip jacket allows attachment and removal in laboratory environments without the use of a wrench.